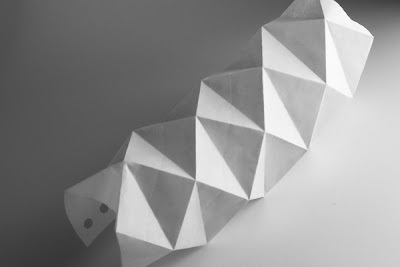 Here is a set of picture of a shape I folded out of a single A4 paper. 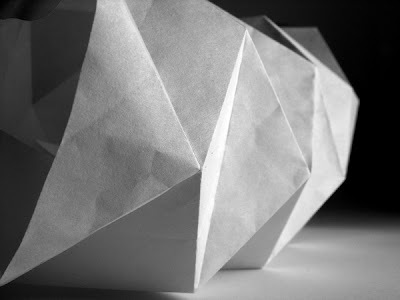 I was inspired by Richard Sweeney and also wanted to find special ways to fold a paper to make it stronger and look different. 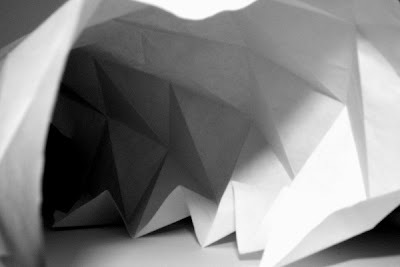 This was pretty hard to fold but it looks very cool, kind of like a crystal shape. But would not recommend on a mass production on this. 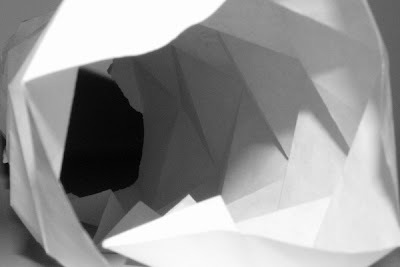 Also tried to learn photographing white on white but seem it is pretty hard. Also keeping the camera better still is hard too, need to buy a camera stand soon. I saw this trick on PopSci DIY. For a quick, cheap, portable camera tripod, take your camera into a hardware store. Find a bolt that fits into the thread at the bottom of the camera (it is a standard thread-size...I just can't remember the size). And get a couple of nuts and washers. Take the cover of a plastic pop bottle and punch a hole in the top so that the shaft of the bolt fits up through the cover. Put one nut on the bolt to hold it to the cover, and then another one to leave a decent amount of the bolt left (depending on the length of the bolt). You can the over-sized washer to give more of a cleaner platform for the camera to sit on. Now, all you do is screw the assembly into the camera and fill any pop bottle with something to keep the base heavy. Put the cover/camera on the bottle and there you go. You can keep this cover with you and use it on any bottle that is handy. I now have professional tripod but thank you for the tip.